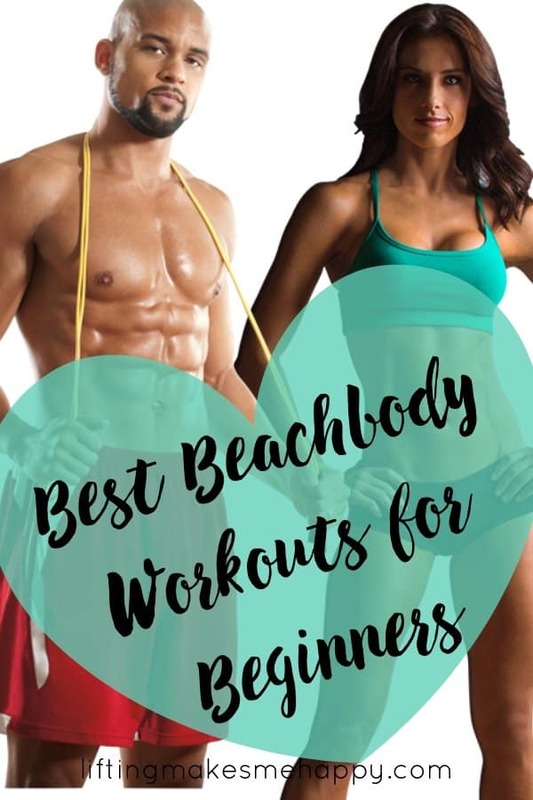 Choosing the best Beachbody workout for beginners can be hard if you’re not familiar with their programs. I am happy to help you choose what’s right for you. And, I’ll even take your likes, your dislikes, whether you have/need equipment or not and your goals into consideration. You never really know how you’ll like something until you get started but I hope this breakdown will help you make the best decision for you. These are all Beachbody programs so they can all be done in your living room! For most Beachbody workouts the minimum amount of space you need is about a 6′ x 6′ square. You don’t need a great big space to do these workouts. *Just wanted to inform you that I have been an Independent Beachbody Coach since November 2011 and it’s because I love their workout programs so much. I’ve completed multiple programs and I love that they keep adding to their library. These recommendations are based on my experiences with the programs and are not “official”. Now, let’s find you a workout! If the most important thing for you right now is to find a workout you can do at home that doesn’t require equipment, I would suggest Insanity Max 30. This workout is created by Shaun T., the man behind the crazy Insanity program. That program is hard! I wouldn’t recommend Insanity for complete beginners unless you’re really looking for a challenge and love cardio. I would stick with Insanity Max 30 because it requires no equipment and there is a modifier making it perfect for anybody to follow. I would advise you that this workout is definitely challenging and you might not make it through each workout in its entirety and that’s okay! Shaun T. doesn’t always make it through either. As long as you push hard and do your best, that’s all you can do! And you will get results. All workouts include a modifier. You’ll have access to a food and MAX tracker. Shaun T. is one of the best motivational fitness trainers there is – and I’m not just talking about Beachbody trainers. He’s the best of the best in the world. You can stream all 16 workouts on Beachbody On Demand. If you like cardio mixed with some bodyweight strength moves, I have to recommend Transform 20 for beginners because it’s only 20 minutes long. This is the latest workout by Shaun T. This workout also has a modifier if you’re feeling lost or can’t keep up when you first begin. The modifier comes in pretty handy for me, let me just say that. I’m so thankful. And just because you’re modifying, doesn’t mean you aren’t working hard because you will be! Transform: 20 will help you burn fat, strengthen your muscles and help you lose weight and inches. You don’t need equipment to start but as you progress you’ll definitely want to invest in a step or at least a couple pairs of dumbbells. There are bonus workouts that add in weights but you don’t need them to start. Each workout is only 20 minutes! Perfect for busy people who aren’t used to making time for workouts. Shaun T. will motivate you; he’s very inspiring and pushes you to keep going. Minimal equipment is required and it’s all optional to start. No two workouts are exactly the same. Workouts are simple but challenging. From beginning to end, the program is 6 weeks long. You can stream all 6 weeks worth of workouts on Beachbody On Demand. I think the best Beachbody strength workout that can help beginners is the 21 Day Fix. This program was created by Autumn Calabrese and consists of strength training, cardio, pilates and yoga. The variety keeps it from getting boring and you also get to try different workouts to see what you like best. And it’s only 21 days long — just 3 weeks. I think the longer 60 and 90-day programs and programs with workouts over 40 minutes long can be a bit intimidating for beginners. I love that Beachbody has started to add shorter programs into their Beachbody on Demand library. It’s a 7-day schedule which can get you into the habit of working out. Once the 21 days are up you can decide to start again or try something else. 21 Day Fix Extreme is a great next step when you’re ready. There is a modifier so you don’t feel intimidated by the moves if you’re new to strength training. This program is designed to help you lose weight fast so it’s perfect if you have a special event coming up. It’s simple! The workouts are simple and the nutrition plan is simple too and utilizes the Portion Control Containers. Actually, most of the Beachbody workouts now incorporate the portion control eating system which makes meal planning simple. If it fits, you can eat it. No counting calories, macros or points. It’s for busy people. We’re all busy, right? Short, effective workouts like this one can be done in just 30 minutes or less. I definitely prefer workouts that don’t drag out. There are 13 workouts included in the Beachbody On Demand library. You’ll get access to the regular program workouts along with the upgrade workouts and bonus workouts too. If you’re a beginner and you want to try yoga, I highly recommend the 3 Week Yoga Retreat for beginners. I am a yoga newbie and don’t know a whole lot but I love going through these workouts. They feel so good. Yoga is great therapy! It really helps increase flexibility and calm your mood too. Master the fundamentals of yoga in just 21 days. It’s only for 21 days. Broken down into 3 phases: Foundation, Expansion and Progression. Available with or without music. Each workout is 10-31 minutes long. You can view every workout on Beachbody On Demand. Now that I’ve outlined several workouts, it’s time to choose what interests you most! To determine this, think about your goals and what kind(s) of activities you’d like to try in your workouts. Do want cardio? Do you want some strength training and some cardio? Do you want yoga? Do you want to increase strength? Do you want to improve endurance? Do you want to increase flexibility? If you’re interested in trying them all they’re all available to stream on Beachbody on Demand. You’ll find several hundred more workouts in the BOD library! This makes it easy to try something new when you complete a program or just want to move on to something else. I hope this has helped you feel a little less overwhelmed and a little more informed about what Beachbody home workout you’d like to try. If you can’t make up your mind, a BOD membership will allow you to stream them all plus hundreds more. If you have any questions, definitely feel free to shoot me a message. I’m happy to help! Finding a workout you actually like and enjoy can make all the difference. And this is coming from a girl who doesn’t love working out! I just love the way I feel after I’m done. Click here to learn more about Beachbody On Demand.